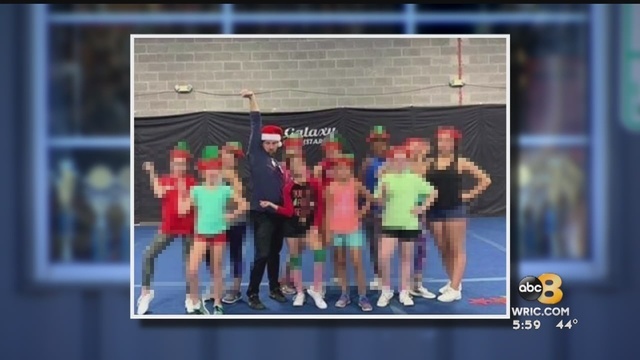 COLONIAL HEIGHTS, Va. (WRIC) — Parents are reeling over the arrest of a popular gymnastics coach accused of sexually assaulting a child. Parents relied on him to coach their children, and kids counted on him to make them better athletes. That coach — Benjamin Jones — is now ordered to stay away from children. “The child put trust in them or in a control or trust position, that makes it even more concerning,” Sgt. Renee Walters with the Colonial Heights Police Department told 8News. According to an indictment, Jones is accused of sexually assaulting a 13- or 14-year-old girl at a home in Colonial Heights last November. Jones is a tumbling and soccer coach who has worked for at least four cheer and soccer clubs in the area. From Goochland to Hanover, the 38-year-old has spent plenty of time around children. Police now want parents to speak to their kids. “If there are potential other victims, sometimes when they see there’s an arrest or there’s been another complaint, then they feel like they can come forward and talk to the police or talk to a parent or a trusted adult to let them know what’s happened,” Sgt. Walters added. A judge granted Jones a $15,000 bond and ordered the Glen Allen man to stay away from children. That didn’t sit well with some parents, who call Jones a predator. Investigators are urging any moms or dads with information to give them a call. 8News spoke with the head of an area soccer club where Jones volunteered as a coach who said he never had any problems with Jones or was aware of any behavioral complaints. The head of that organization also insisted that Jones passed a national background check.